Fresh and wonderfully preserved US Caramel Gehrig which ranks as the finest example we've brokered in recent years. The offered '6' displays outstanding print, color and focus for the issue. Beautifully centered with mostly square corners and strong card stock throughout. 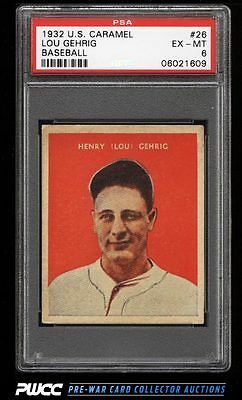 A very rare offering in high grade and deserving of the finest Gehrig or Yankee collection. One of nearly 20,000 cards, lots, and sets up for bid in our 7th Auction of 2016. Click on the link above to view the other PWCC auction lots.